Click Image to view detail. 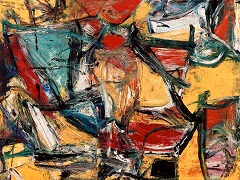 Composition serves as a bridge between the Women and de Kooning's next series of work, classified by critic Thomas Hess as the Abstract Urban Landscapes (1955 - 58). 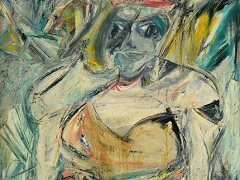 According to the artist, "the landscape is in the Woman and there is Woman in the landscapes." 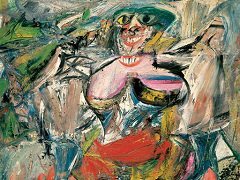 Indeed, Composition reads as a Woman obfuscated by de Kooning's agitated brushwork, clashing colors, and allover composition with no fixed viewpoint. Completed while the artist had a studio in downtown New York, Composition's energized dashes of red, turquoise, and chrome yellow suggest the frenetic pace of city life, without representing any identifiable urban inhabitants or forms. 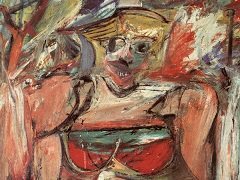 Painted 20 years later, after de Kooning moved to East Hampton, New York, seeking to work in greater peace and isolation, ... Whose Name Was Writ in Water takes nature as its theme. 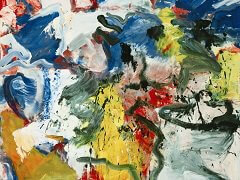 Water was a favorite subject of the artist, and he devised a rapid, slippery technique of broad impasto strokes with frayed edges, speckled with drips, to convey its fluidity and breaking movement. 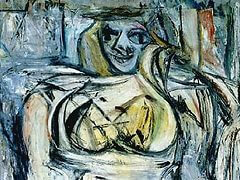 The title, taken from an epigraph on Keats's tomb, which de Kooning had seen on a trip to Rome in 1960, is, according to critic Harold Rosenberg, "the closest de Kooning can come to saluting overtly the impermanence of existence, and things in a state of disappearance." 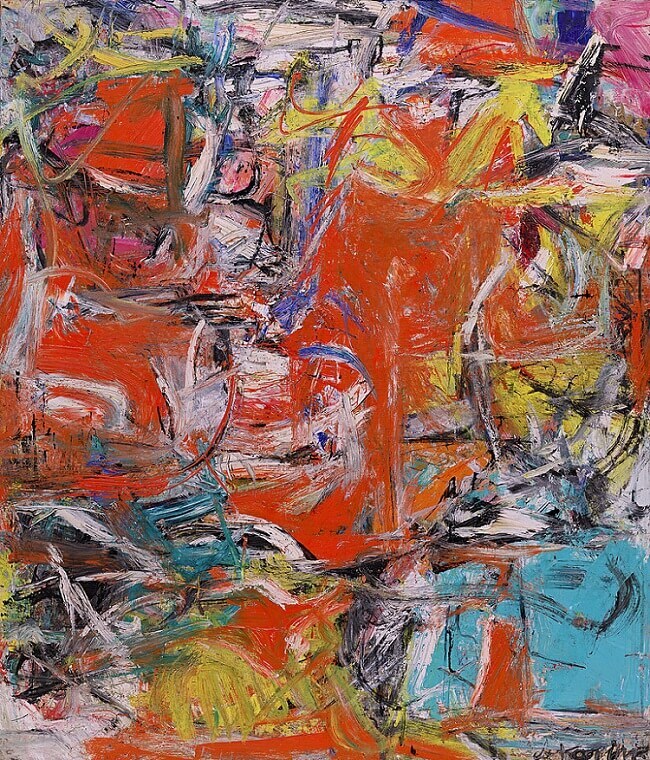 Always aiming to reinforce the content of his work with his technique, de Kooning reworked his canvases over and over again, making each painting a composite of evanescent visual traces. 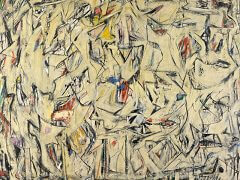 The scrambled pictorial vocabulary and condensed space of the urban landscapes was gradually diffused in de Kooning's later work. More open compositions, a less cluttered palette, and looser, liquid brushstrokes reveal a painter relieved of the nervous, claustrophobic atmosphere of city life and newly at peace with his rural surroundings. 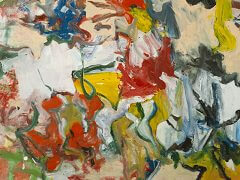 Copyright © 2011-Present www.William-de-Kooning.org. All Rights Reserved.